← “Pic of the Week”, April 13, 2018: Boo the Bear, Golden B.C. Martlin Luther King Jr Memorial, Washington D.C.
One of the newer memorials in Washington DC is also one of its most unusual and memorable. The Martin Luther King (MLK) Jr. Memorial is located adjacent to the Tidal Basin in West Potomac Park, beside the National Mall and the FDR Memorial. 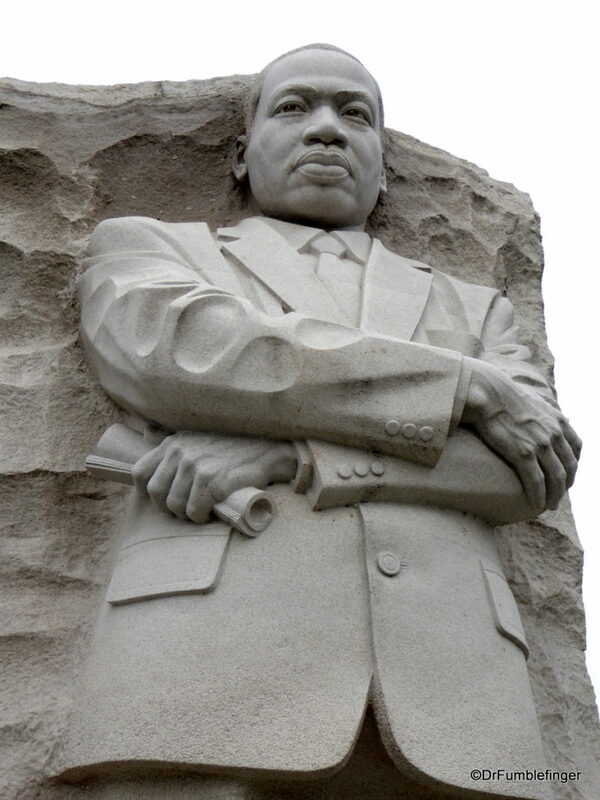 The MLK Memorial is spread along the banks of the Tidal Basin and cover four acres, but is centered on a carving of the famous Civil Rights leader. The MLK statue is incorporated into part of a large granite boulder that has been sliced into three pieces, much like the layers of a giant sandwich. To enter the monument from the National Mall, you walk through the outer two slices and approach the thinner central slice, the Stone of Hope, where on sculptor Lei Yixin crafted the image of King. The monument is inspired by a line from King’s “I Have A Dream” speech, which was delivered on the steps of the Lincoln Memorial. “Out of the mountain of despair, a stone of hope.” It is a life-like if gigantic portrayal of the great man, measuring 30 ft (9.1 m) tall. The memorial opened to the public in 2011 after more than 20 years of planning and fund-raising. Martin Luther King Jr Memorial, Washington D.C.
A 450 feet (140 m) long Inscription Wall rims the MLK Memorial and includes several excerpts from King’s sermons and most famous speeches given between 1955 and the year of his death, 1968. A number of these quotes are illustrated in the accompanying photos (below). I visited the site in late fall on a rather bleak and cloudy day. I would love to see it sometime in the spring when the thousands of cherry trees around the Tidal Basin are in bloom. This MLK Memorial is administered by the National Park Service. It is the Park Service’s 395th unit, if anyone’s counting. There is no fee to visit. The Memorial is open 24 hours a day. There is no visitor center at the site, nor is one needed. The Memorial itself does a great job of conveying what you need to know. Restrooms can be found at the adjoin FDR Memorial. One Response to Martlin Luther King Jr Memorial, Washington D.C.